1990: Soul II Soul for "African Dance"
1993: Miles Davis for "Doo-Bop"
Soul II Soul are a British musical group formed in London in 1988. They are best known for their 1989 UK chart-topper and US top five hit "Back to Life ", and "Keep On Movin'" which reached number five in the UK and number 11 in the US. They won two Grammy Awards, and have been nominated for five Brit Awards—twice for Best British Group. The 33rd Annual Grammy Awards were held on February 20, 1991. They recognized accomplishments by musicians from the previous year. Quincy Jones was the night's biggest winner winning a total of six awards including Album of the Year. 1980: Earth, Wind & Fire for "Boogie Wonderland"
1981: George Benson for "Off Broadway"
1982: David Sanborn for "All I Need Is You"
1983: Marvin Gaye for "Sexual Healing (Instrumental Version)"
1984: Herbie Hancock for "Rockit"
1985: Herbie Hancock for "Sound System"
1986: Ernie Watts for "Musician"
1987: Yellowjackets for "And You Know That"
1988: David Sanborn for "Chicago Song"
1989: Chick Corea for "Light Years"
The 22nd Annual Grammy Awards were held on February 27, 1980, at Shrine Auditorium, Los Angeles, and were broadcast live on American television. They recognized accomplishments by musicians from the year 1979. This year was notable for being the first year to have a designated category for Rock music. Earth, Wind & Fire is an American band that has spanned the musical genres of R&B, soul, funk, jazz, disco, pop, rock, dance, Latin, and Afro pop. They have been described as one of the most innovative and commercially successful acts of all time. Rolling Stone called them "innovative, precise yet sensual, calculated yet galvanizing" and declared that the band "changed the sound of black pop". VH1 has also described EWF as "one of the greatest bands" ever. 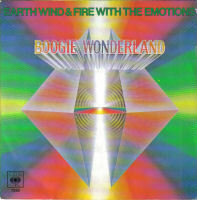 "Boogie Wonderland" is a single by Earth, Wind & Fire with The Emotions issued in April 1979 on Columbia Records. The song rose to number 14 on the disco chart, number 6 on the Billboard Hot 100 and number 2 on the Hot Soul Singles chart. Boogie Wonderland was certified Gold in the US by the RIAA and Gold in the UK by the BPI. 1979: Earth, Wind & Fire for "Runnin'"
The Average White Band are a Scottish funk and R&B band that had a series of soul and disco hits between 1974 and 1980. They are best known for their million-selling instrumental track "Pick Up the Pieces", and their albums AWB and Cut the Cake. The band name was initially proposed by Bonnie Bramlett; the band backed Bramlett on her first solo outing, 1973's Sweet Bonnie Bramlett, an album that presaged the Disco movement, particularly with the track Crazy 'Bout My Baby played heavily in dance clubs. They have influenced others such as the Brand New Heavies, and been sampled by various musicians including the Beastie Boys, TLC, The Beatnuts, Too Short, Ice Cube, Eric B. & Rakim, Nas, and A Tribe Called Quest, Christina Milian, as well as Arrested Development – making them the 15th most sampled act in history. As of 2018, 46 years after their formation, they continue to perform. 1978: The Brothers Johnson for "Q"
Brecker Brothers was the jazz duo of Michael Brecker and Randy Brecker. Michael played saxophone, flute, and EWI, and Randy played trumpet and flugelhorn. Stuff was an American jazz-funk band during the late 1970s and early 1980s. The members were Gordon Edwards, Richard Tee (keyboards), Eric Gale (guitar), Cornell Dupree (guitar), Chris Parker (drums), and later Steve Gadd (drums). 1977: George Benson for "Theme From Good King Bad"
1976: Silver Convention for "Fly, Robin, Fly"
1975: MFSB for "The Sound of Philadelphia"
1974: Ramsey Lewis for "Hang on Sloopy"
1973: Paul Riser & The Temptations for "Papa Was a Rollin' Stone (Instrumental)"
1970: King Curtis for "Games People Play"
The 21st Annual Grammy Awards were held in 1979, and were broadcast live on American television. They recognized accomplishments by musicians from the year 1978. The Crusaders was an American jazz fusion group that was popular in the 1970s. The group was known as the Jazz Crusaders before shortening its name in 1971. 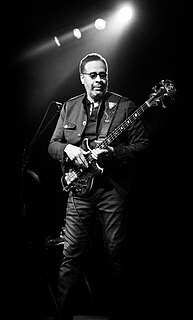 Stanley Clarke is an American bassist and founding member of Return to Forever, one of the first jazz fusion bands. He has composed music for films and television and has worked with musicians in many genres. Like Jaco Pastorius, Clarke gave the bass guitar a prominence it lacked in jazz-related music. Herbert Jeffrey Hancock is an American pianist, keyboardist, bandleader, composer and actor. Hancock started his career with Donald Byrd. He shortly thereafter joined the Miles Davis Quintet where he helped to redefine the role of a jazz rhythm section and was one of the primary architects of the post-bop sound. In the 1970s, Hancock experimented with jazz fusion, funk, and electro styles. Melvin Ragin, better known by the nickname "Wah Wah Watson", was an American guitarist and session musician famed for his skills with a wah-wah pedal. The 37th Annual Grammy Awards were presented on March 1, 1995, at Shrine Auditorium, Los Angeles. They recognized accomplishments by musicians from the previous year. Bruce Springsteen was the night's biggest winner with 4 awards, including Song of the Year while opening the show with his Grammy nominated hit. The Grammy Award for Best Instrumental Composition has been awarded since 1960. The award is presented to the composer of an original piece of music, first released during the eligibility year. In theory, any style of music is eligible for this category, but winning compositions are usually in the jazz or film score genres. 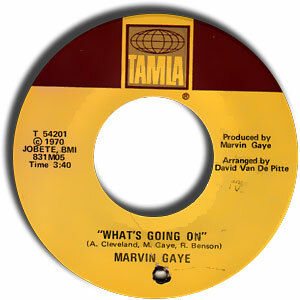 "What's Going On" is a song by American recording artist Marvin Gaye, released in 1971 on the Motown subsidiary Tamla. Originally inspired by a police brutality incident witnessed by Renaldo "Obie" Benson, the song was composed by Benson, Al Cleveland and Gaye and produced by Gaye himself. The song marked Gaye's departure from the Motown Sound towards more personal material. Later topping the Hot Soul Singles chart for five weeks and crossing over to number two on the Billboard Hot 100, it would sell over two million copies, becoming Gaye's second-most successful Motown song to date. "I Want You" is a song written by songwriters Leon Ware and Arthur "T-Boy" Ross and performed by singer Marvin Gaye. It was released as a single in 1976 on his fourteenth studio album of the same name on the Tamla label. The song introduced a change in musical styles for Gaye, who before then had been recording songs with a funk edge. Songs such as this gave him a disco audience thanks to Ware, who produced the song alongside Gaye. "After the Dance" is a slow jam recorded by singer Marvin Gaye and released as the second single off Gaye's hit album I Want You (1976). Though it received modest success, the song was one of Marvin's best ballads and served as part of the template for quiet storm and urban contemporary ballads that came afterwards. Randal Edward Brecker is an American trumpeter, flugelhornist, and composer. His versatility has made him a popular studio musician who has recorded with acts in jazz, rock, and R&B. Directions in Music: Live at Massey Hall is a live recording by Herbie Hancock, Roy Hargrove and Michael Brecker. It was recorded on October 25, 2001 in Toronto, and was subtitled, Celebrating Miles Davis & John Coltrane. It was Hancock's forty-fourth album. Pilgrimage is the final studio album by saxophonist Michael Brecker. It was recorded in 2006, released the following year, and won Grammys for Best Jazz Instrumental Album, Individual or Group and Best Jazz Instrumental Solo. The Hampton Jazz Festival is a major musical event started in 1968, and features many of the world's major jazz artists. It is held during the last full weekend in June each year, with the primary venue being Hampton, Virginia's Hampton Coliseum. Festival organizers describe it as "the best available jazz, R&B and blues artists that are on tour during the time of the festival... packaged at a reasonable price." Nearness of You: The Ballad Book is the seventh studio album of saxophone player Michael Brecker. Accompanied by Herbie Hancock on piano, Pat Metheny on guitars, Charlie Haden on bass, Jack DeJohnette on drums, and a special guest appearance by James Taylor, the album was released by Verve Records on June 19, 2001. 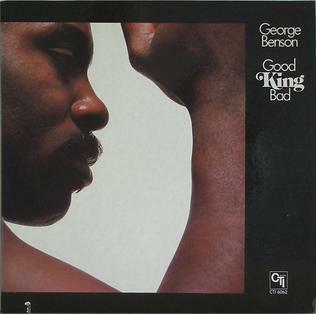 Good King Bad is a studio album by American guitarist George Benson featuring performances recorded in 1975 and released by CTI Records in 1976. 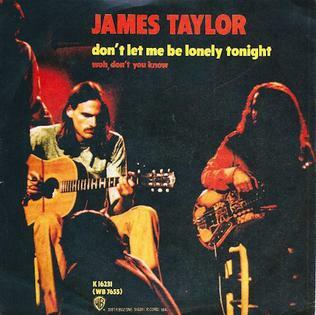 "Don't Let Me Be Lonely Tonight" is a song written and performed by American singer-songwriter James Taylor, from his 1972 album One Man Dog. It was released as the lead single from the album, and peaked at #14 on the U.S. Billboard Hot 100 on January 13, 1973. It also reached #3 Easy Listening. In Canada, the song reached #18 on the Pop Singles chart and #7 AC. The Brecker Bros. is the debut album by the American jazz fusion group, the Brecker Brothers. It was released by Arista Records in 1975.